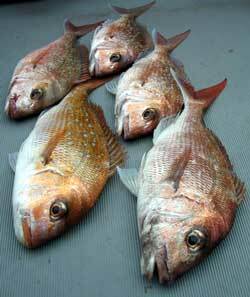 During the last spate of easterly winds, kitefishers continued to report great catches of snapper, gurnard and kahawai from west coast beaches. Steve Barnes Does It Again! 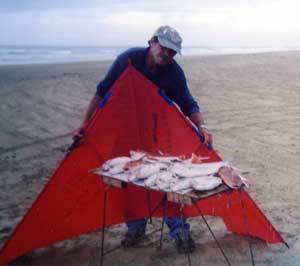 You may remember that Steve Barnes featured in last months kite report with a nine kilogram Muriwai snapper. Well he has done it again! 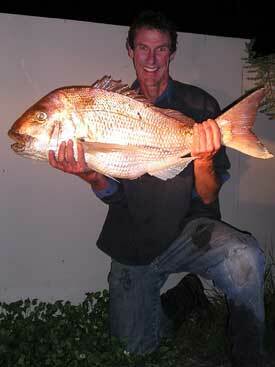 Steve caught this 12 kilogram snapper during November at Muriwai Beach. He drove five kilometres up from Rimmer Road and fished ten hooks per set with his Paul's Fishing Kites 65kg dropper rig. Steve was using freshly caught kahawai for bait and fished three sets on an outgoing tide. The winds were light so Steve used a combination of the Nighthawk and Skyhook kites to get enough pull to tow the big rig out. 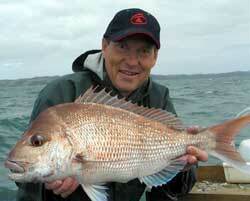 Steve was rewarded with three snapper, three gurnard and a kahawai for the day. The big snapper was taken on the last set of the day at 7.00 pm. We caught this well conditioned snapper and 12 others during a westerly storm at Kawakawa Bay last Sunday on our Paul's Fishing Kites boat longline. He looks quite big but weighed in at only 7lb. I also had two sets of the boat longline in the rain on Saturday morning, we fished two kilometers out from the ramp at Kawakawa Bay. The fish in the photo on the right were caught on the first set of 25 hooks on the Saturday. We caught about the same number of similar sized fish on the second set. I had nine good sized pannies and was home by 10.00am. Ed : Paul Major from the Weymouth Boating Club has been using a Paul's Fishing Kites boat longline with floating bead traces for several years now. During this time he has been our most consistent reporter and certainly one who sends in consistently stunning pics. Paul has won the Pic of the Month gift voucher several times. Thanks from the team for the effort Paul. Hi. I went to Uretiti Beach on Sunday the 5th of December. Just wasn't my day at all. Four times the safety spar in my kite broke due to very strong winds. Every 15 minutes or so real nasty squalls would come through but eventually we got the longline set out to 1400 metres offshore. Some of the squalls looked to be well over 60 knots. My days effort only resulted in two gurnard. Pic Above right : Me with a few of my own taken off the West Coast not so long ago. A bloke in a 4x4 came along the beach as I was packing up for the day and asked how I'd got on. I told him of my day and my gurnard and he grinned. Have a look in my chilly bin he said. Well, I can tell you, he had a snapper in there that took up the full length of the bin. Dennis Nash introduced himself to me and told me he caught the beauty the night before in much colder conditions. Dennis was using a submarine to catch the huge 13.5kg snapper which he'd had weighed at the butcher's and was still on ice. He plans to get it mounted. This year 31 kite fishing teams from all over the North Island fished the Karikari Kitefishing Klassic contest. The competition began at 6:00am Thursday 2nd of November. The wind was about 20 knots from the west so fishing from Tokerau Beach was absolutely ideal. A total of 42 snapper and 40 gurnard were weighed in on day one with the heaviest snapper at 5.64kg. On the second day, the wind dropped to lighter south to southwest winds, so teams fished both sides of the Karikari Peninsula. A total of 31 snapper and 26 gurnard were weighed in on day two and the heaviest snapper was 3.24kg. On the last day of the contest, conditions favoured Karikari and Puheke with south to southwest winds of 10 to 15 knots. A total of 22 snapper and 10 gurnard were weighed in. 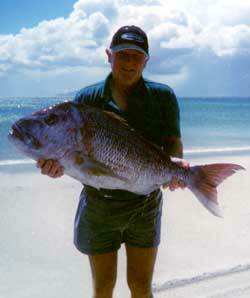 The heaviest snapper of the last day, and the contest, weighed in at 9.6kg. 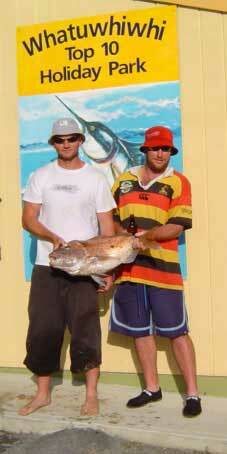 Next year the Karikari Kitefishing Klassic will be held December 1st, 2nd and 3rd, 2005. Entries will be restricted to the first 50 teams so be in quick. Hi everyone. The fishing's been really hard down here lately. Not too many offshore winds. I only managed to get my kite gear out twice last month which resulted in no snapper but plenty of gurnard and a few sharks. We set the timer of the torpedo to 10 minutes as the area we wanted to fish is only about 600 meters off shore. My mate Jacko baited up the trace board with a mixture of squid, mullet and bonito and we set the fishing torpedo off. It ran dead straight out and we left it to fish for an hour while we sat back and had a well earned cold one or two. We started up the recovery unit and the first set returned a steady catch of good fish. The second set returned another good haul and we ran out of room in the chilly bin so had to wrap the rest of the fish in the ground sheet. We had caught our bag limit in only two sets. All that was left to do was head back home, wash down the torpedo and all the gear for another day before enjoying a good feed of fresh fish. This is an important message to alert you to a change in Government policy which if not acted upon could result in your rights to fish in the sea being severely reduced. Please read it in it's entirety. Four years ago a group called option4 formed to counter the ill conceived "Soundings" proposals which would have inevitably led to the privatisation of all recreational fisheries and compulsory recreational fishing licenses to fish in the sea. Had these proposals succeeded the public would have become little more than minor shareholders in a commercial fishery. option4 overwhelmingly defeated the privitisation of the recreational fishery and recreational licensing recommended in "Soundings" by raising 70,000 submissions against them, (a record in any Government consultation process). The option4 group has continued to strengthen since then and they have maintained a team of dedicated people at the forefront in fisheries management, protecting the rights of the public to fish for food and recreation ever since. Now option4 need your help to prevent the Government completing their privatisation agenda for recreational fisheries by stealth. Fisheries Minister Benson Pope recently made a decision to allocate kahawai between commercial and non-commercial fishers which has outraged all of the major recreational fishing organization's. The way he has made the decision is based precisely on the proportional system the public had rejected so completely when it was presented in "Soundings". Effectively, the decision means kahawai are to be taken from the tables of recreational fishers and given in perpetuity to the fishing industry so they can continue to export it for crayfish bait, pet food and other low value uses. Option4 is determined to deploy every resource to overturn this decision and to undo the precedent set by it. If this decision is allowed to stand we will soon become minor shareholders in all fisheries we have an interest in. Make no mistake, the Ministry will certainly use this decision as a precedent to guide their future fisheries allocation policy and advice to Ministers! If the ministry succeed and we still want our fish back, we will then have to buy our fishing rights back from the fishing industry. The Ministry of Fisheries scientists advised the Fisheries Minister that a 15% cut to the combined commercial and non commercial catches should be sufficient to prevent further decline in the kahawai fishery and possibly even allow some rebuild of the stock to occur. The Minister, in his original decision, gave the fishing industry a 6% increase in quota and initially asked that non commercial fishers catches be reduced by 15%. This would have required your kahawai bag limit to be cut from 20 down to as few as 2 or 3 fish and would have taken 1.2 million meals of kahawai off the tables of non-commercial fishers and their families. Now that the Minister has backed away from cutting recreational catch limits, his decision will see an overall increase of 3% in the combined fishing efforts of commercial and non commercial kahawai fishers and therefore the important kahawai fishery will continue to decline. option4 believes the Ministers' decision is seriously flawed on several levels and sets a precedent where non-commercial fish have been taken from the public and given to the commercial fishing industry simply to prop up obviously excessive commercial catches. option4 also believe that these precedents MUST be challenged in court with every available resource. As a direct consequence of the Ministers decision the numbers of kahawai available to to be caught by non-commercial fishers could drop by as much as 60% below current levels. This is in a fishery most recreational fishers already consider massively overfished. As the stock continues to decline non-commercial fishers will catch less and less kahawai as they become scarcer. This will set the stage for yet another cut to recreational allowances as our allowance is cut to match our NEW lower catch levels. If we do nothing, if we do not stand as one and fight this unjust decision, a precedent will be set and, in time, it will be coming to a beach, a bay or a fishery near you! option4 have made it easy for you to make a real difference. Please take the opportunity to assist the Kahawai Legal Challenge in one of the following ways. 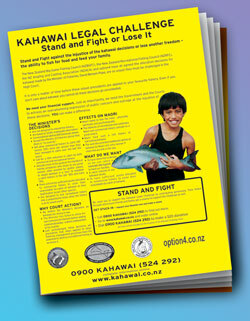 option4 have produced a great booklet and information pack on the kahawai issue to assist those who want to take a firm stand against the Ministers kahawai decision and help the cause. This booklet covers all of the main points covered here and includes an information pack on how you can help option4 to stop the madness in its tracks. The book is a great asset and talking point for those who want to chat with family and mates about the serious threats facing recreational fishing over the holidays. Every fishing tackle shop and fishing club should also have several of these booklets on hand for their customers and members to use. If you go fishing, please send in a report and make Peggy's job of putting this newsletter together easier. Don't forget to take your camera when you go fishing and send or e-mail in your pics please. All fishing reports are welcome. They do not have to be recent. Any information about your kitefishing, surfcasting, boat, kayak or kontiki experience is welcome. If you want photos returned please include you mailing address.